Thanks to some gift cards left over from our wedding that I came across recently (best unexpected bonus ever), I have a new toy: The KitchenAid Mixer Pasta Press Attachment. When I was a kid, I adored the Play-Doh extruder where you push down on the lever and make different shapes come out depending on which plate you used. In the last few weeks, I've learned that pasta dough is Play-Doh for adults, and I'm in a complete wonderland. 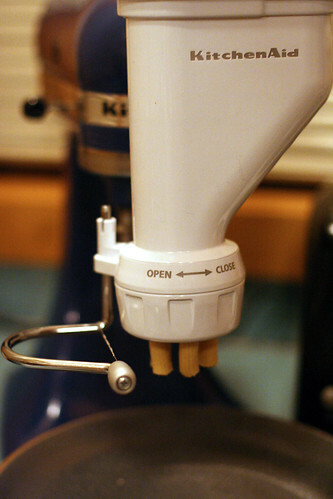 This mixer attachment makes 6 shapes: large macaroni, small macaroni, fusili, rigatoni, bucatini, and spaghetti. Yes, I have the 6 shapes memorized and tell almost everyone I meet. 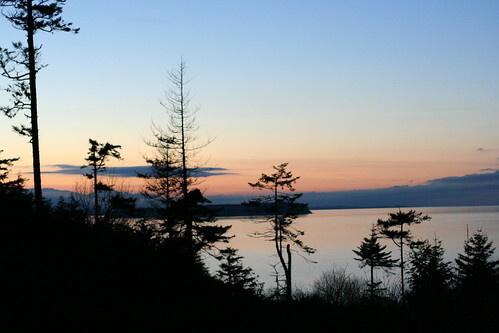 Over the holidays, we traveled to my family's cabin in Port Townsend, Washington (my favorite place in the world). Along with our luggage and the dog in the car came Little Blue, my trusty KitchenAid mixer, and my new attachment. Almost every night for dinner while we were there, I made a different shape of pasta with a different sauce. The whole process is fairly labor intensive, but it's totally worth it if you're willing to put in some effort. I'm never buying pasta again! Macaroni & cheese was quite apropos for our cozy cabin on the water. I ate it curled up on the couch, watching the sun set over the ocean and listening to the fire crackle. Like every other Cook's Illustrated/America's Test Kitchen recipe I've ever tried, this one was a huge winner. I halved the recipe to get the quantities below; feel free to double it and bake in a 9x13 broiler-safe dish to serve a crowd. 2. For the pasta and cheese: Adjust oven rack to lower-middle position and heat broiler. Bring 4 quarts water to boil in Dutch oven over high heat. Add macaroni and 1/2 tablespoon salt; cook until pasta is tender. Drain pasta and set aside in colander. 3. In now-empty Dutch oven, heat butter over medium-high heat until foaming. Add flour, mustard, and cayenne (if using) and whisk well to combine. Continue whisking until mixture becomes fragrant and deepens in color, about 1 minute. Gradually whisk in milk; bring mixture to boil, whisking constantly (mixture must reach full boil to fully thicken). Reduce heat to medium and simmer, whisking occasionally, until thickened to consistency of heavy cream, about 5 minutes. Off heat, whisk in cheeses and 1/2 teaspoon salt until cheeses are fully melted. Add pasta and cook over medium-low heat, stirring constantly, until mixture is steaming and heated through, about 6 minutes. 4. Transfer mixture to broiler-safe 8x8-inch baking dish and sprinkle evenly with bread crumbs. Broil until crumbs are deep golden brown, 3 to 5 minutes, rotating pan if necessary for even browning. Cool about 5 minutes, then serve. Ultimate comfort food, for sure! I really want to drag out my pasta maker more often this year. Just wondering... did you have to do anything differently since you used fresh pasta in the recipe... or did you still boil it for a couple minutes and then bake it? 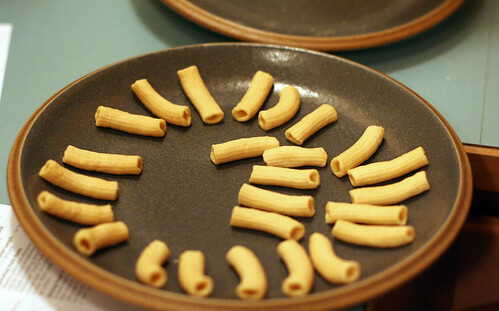 Amy, that pasta press looks amazing! Fresh pasta is so dreamy =D. Not to mention that mac & cheese is awesome! Yum - this sounds so good (and pretty easy). 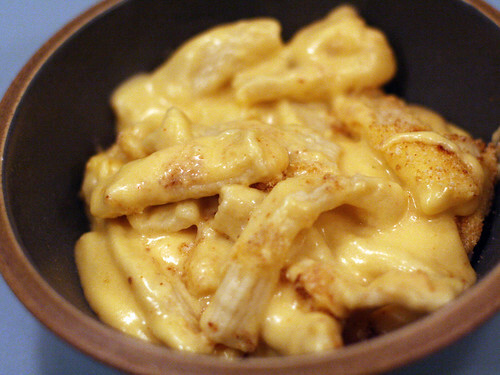 My husband was wanting homemade Mac & Cheese recently - maybe I'll give this recipe a try. I think I might need to get that KA Pasta attachment this year...that and a breadmaker are my two kitchen gadget/appliance "wants." Megan~ I prepared it as if it were dried, boiled for a few minutes and then went ahead with the recipe. Let me know how it turns out if you make it! Yes! This thing is awesome, we got one for Christmas and made some bucatini over the weekend. I love this attachment - your noodles look great. I can't wait to try the other shapes. Yum! I want to make this tonight, but don't have powered mustard - do you think regular yellow, spicy brown, or dijon mustard could be substitute. and if so, in what quantity? thanks! Lauren~ I'm glad you're going to make it, hope you enjoy! I'm not a fan of mustard at all, so I begrudgingly added the powder and luckily couldn't taste it. Since I avoid it wherever possible, I'm not sure about substitutions and quantities. Sorry I can't be of more help.. maybe try Googling mustard powder substitutions? Thanks for the advice, Amy. How brave of you to include the powdered mustard, even though you hate the taste. Thanks to good ol' google, the general concesus on the interweb is 1tsp powdered mustard = 1tbsp prepared mustard. I think i'll go dijon. that is so neat! I forgot about all the possible attachments for my kitchenaid. My grandma has a pasta machine - she's italian and used to make all her pasta. We've used it for linguine and ravioli and i love it! I just love that you brought your Kitchen Aid on vacation! Now that's devotion. that pasta attachment is the coolest thing ever!!!! Sounds like you are enjoying it!!! !